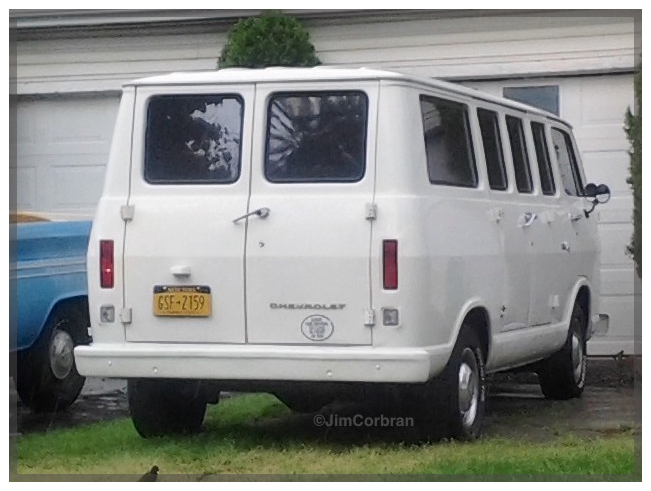 We’ve come across this 1967 Chevy Sportvan a few times over the years. The photo above is from the 2014 Canal Fest Car Show in Tonawanda, while the rear shot was taken in Lockport last year. Back in the day it seems like most of the ones we saw were work vans, without windows and seats; but the passenger versions were pretty handy for large families, with seating for eight and an extended wheelbase version (like this one) with plenty of extra cargo space. Overall they were similar lengthwise to the original mid-1980s Dodge Caravan minivans, but were about a foot taller.